My new favorite way to make a burger. I made a grain free baked tomato and topped a bacon burger with it . I dipped the large tomato slice in a beaten egg and then covered it in a grain free breading mixture. Then baked on an oiled pan in oven, until browned on each side. Good served on lettuce wrap or on grain free bread. I included a link to my grain free bread recipe at the bottom of the recipe. 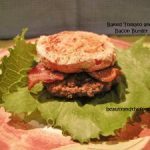 The baked tomato is extra yummy on a burger, like a crispy BLT. My family loved these burgers, even the tomato haters. 1 lb ground Beef formed into 4 patties and cooked or grilled as desired. 1 slices to 2 large tomatoes sliced thick, 4 to 5 . 4 slices to 6 Bacon cooked ( nitrate free kind). Preheat Oven to 400 F, and line or oil a baking sheet. Beat eggs with with ground mustard in a bowl, and set aside. Mix in a separate bowl: Coconut Flour, Sunflower seed meal, Parmesan (optional), Sea Salt, Garlic powder, Onion powder, Paprika, Cayenne pepper (optional). Take Tomato Slices and dip in egg mixture, then place in coconut flour mixture bowl and cover with the breading on all sides. Place each tomato slice on baking sheet. Bake in Oven for about 10 to 12 minutes then turn slices and bake for 10 more minutes or until lightly browned. Take your Burger patty and put bacon on top of patty. Place a baked tomato on top of bacon slices. Wrap in a lettuce leaf or put on some grain free bread. Nutritional facts include burger, bacon, and baked tomato.